Wouldn’t it be great if your son or daughter came up to you and explained how a elevator or a washing machine works or what a differential is and how it works? 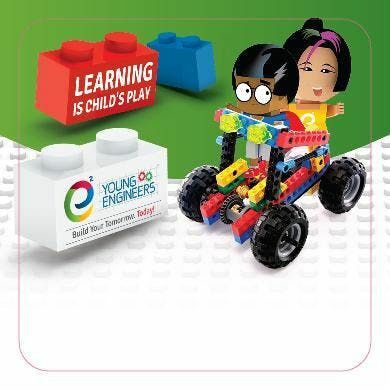 Enrol your child (aged 6 -12 years) today on an e2 Young Engineers LEGO® Challenge Edutainment programme and they will learn about these things and much more, all whilst playing! Through the use of stories, exciting experiments and building originally designed LEGO® models that illustrate Science, Engineering and Mathematics topics, your child will have FUN while learning and developing fine motor, visual-spatial and social skills to name just a few. Specially for Engineers Week 2019 we have picked 3 different models to display very important and entertaining Engineering concepts, Belt Transmission, Gravitational Force, Mass, Double Speed Increasing transmission and GEAR TRANSMISSION with a practical examples of all these concepts. All instructors are Garda Vetted and highly trained. These tickets are non-refundable.Any child under the age of 6 will not be allowed to attend the workshop even if you have a valid ticket for it.